Preheat the oven to 180 ° C, and put some muffin cups in the muffin tin. Mix the sugar and lemon zest. In another bowl, whip the eggs and then add vanilla, honey and cream cheese. Mix well and add the melted butter and lemon juice. In a third bowl, mix the dry ingredients and 2/3 of sugar with lemon. Add them to the egg mixture and stir with a whisk. You'll get a bit thicker batter. 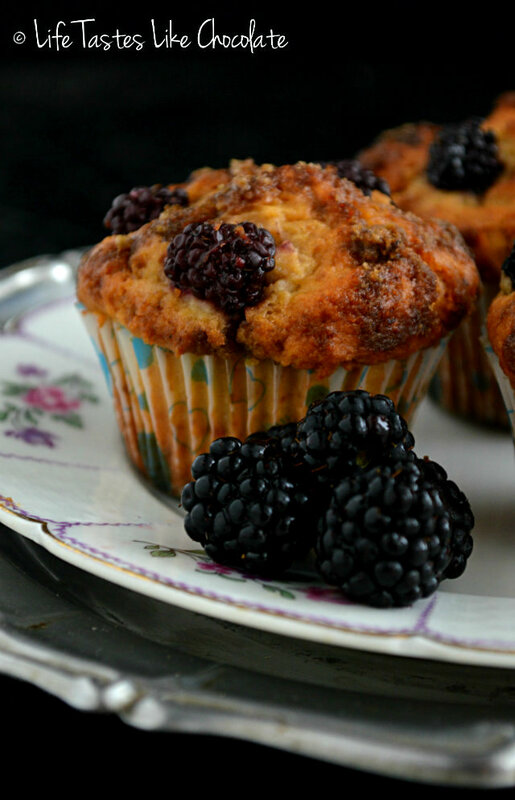 Put a bit of batter on the bottom of each muffin cup, then push two blackberries in, and cover with the rest of the batter and press 2-3 blackberries on top. You should fill the cups almost to the top to get this pretty, rustic muffin top. Sprinkle the top with the rest of the sugar with lemon and bake for about 25 minutes, ie until a toothpick stabbed in the middle comes out clean. Serve chilled. Bon appetit!